Camera Model Identification is the digital forensic problem of identifying the source of an image under question, i.e., to map the image to its source device. This assists forensic analysts to map a suspect’s camera with a possibly illegal image repository, or to attribute an image under question to its legitimate source. Counter–forensic attacks to Camera Model Identification techniques, primarily comprise of image anonymization. Image Anonymization is a technique adopted by an intelligent adversary for modifying an image illegitimately, so as to disable attribution of the image to its source; hence to fool a forensic analyst and prevent image source identification. 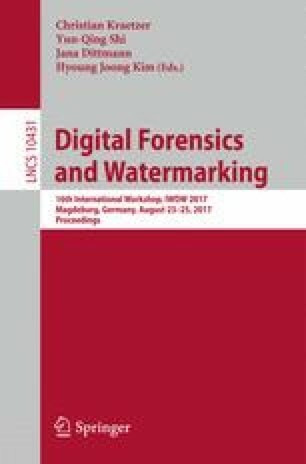 In the recent years, there has been a rapid growth of research interest in the domain of counter–forensics. In this paper, we develop a deep learning based Convolutional Neural Network (CNN) to detect whether an image under question has undergone any form of counter–forensic source anonymization attack. This will enable a forensic analyst to find out whether an image, whose source is being investigated, is authentic, or has it been tampered so as to prevent correct source identification. We deal with three major classes of source anonymization attacks in this paper, viz., Seam Carving, Fingerprint Copying, and Adaptive PRNU Denoising. If an image is detected to have indeed undergone a counter–forensic attack, the proposed model additionally enables detection of the specific class of attack, through multiclass classification. Our experimental results prove that the detection accuracy of the proposed system is considerably high, and it passes the overfitting test too.